In the last 10 years, we have successfully installed over two dozen spent caustic wet oxidation systems, with capacities varying from 0.5 to 18.5 m3/h (2 to 81 gpm). 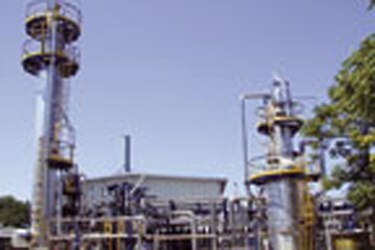 Our systems are the industry standard and are included in many of the new world-scale ethylene plants. oil refining - from the extraction or treatment of acidic impurities, such as hydrogen sulfide, mercaptans and organic acids in hydrocarbon streams. These spent caustic streams are a significant odor source as well as disruptive to the operation of a biotreatment facility. In addition, the Chemical Oxygen Demand (COD) load in spent caustic is usually very high (10,000 - 100,000 mg/l), and the contaminants in spent caustic typically include sodium carbonate, sodium sulfides, mercaptans, phenols, and emulsified hydrocarbons. Low temperature (<150°C): Achieves partial oxidation of sulfides to both sulfate and thiosulfate. Applicable for dilute sulfidic caustics when thiosulfate is not a concern for downstream treatment. Medium temperature (approx. 200°C): Achieves complete oxidation of sulfides to sulfate. Also destroys mercaptans. Commonly used for sulfidic ethylene spent caustic treatment. High temperature (approx. 260°C): Achieves complete oxidation of sulfides and mercaptans, plus destruction of organic contaminants such as cresylic acids. Applied to refinery spent caustics.